The designer, Alan Entwistle, has an impressive biography and has clearly been in the business of designing guitars for years. 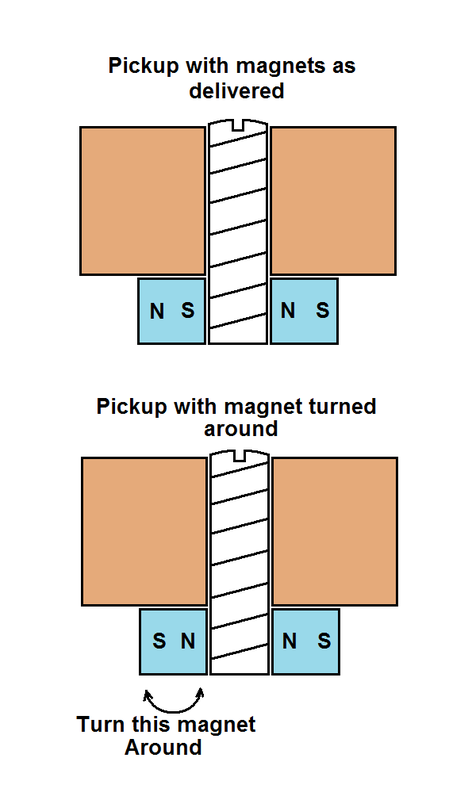 I liked the idea of using neodymium magnets, too, because, in theory, more magnetism = more output. And I am all for improving the signal to noise ratio. When the pickups arrived, they were just wrapped up in a bit of bubble wrap in a padded bag. The first thing I noticed was that a couple of the wires were hanging by a thread - and one of them fell off almost immediately. 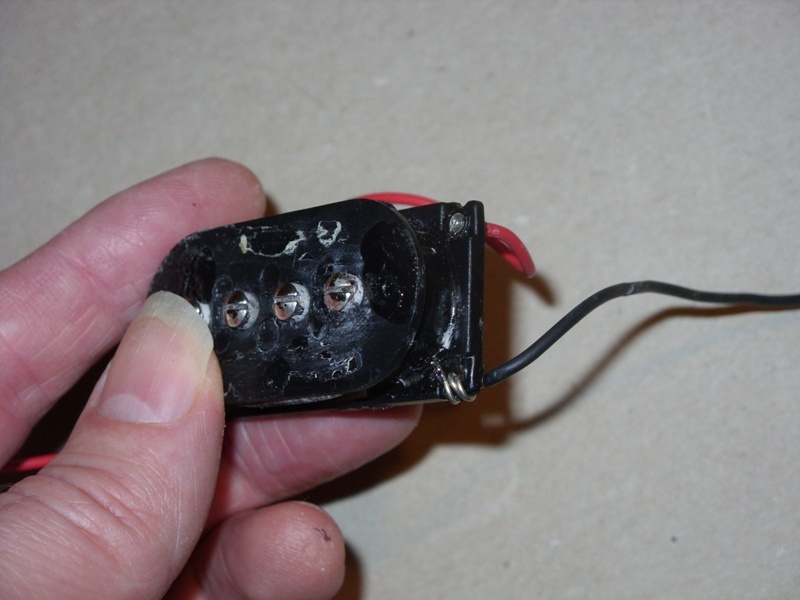 To make matters worse, the wires are soldered to small brass ferrules in the plastic bobbin of the pickup. When you heat the ferrule up to make a soldered joint the plastic melts, so you have to be very quick. On the other side of the ferrule is a hair-thin copper wire. It is all very unsatisfactory. The photo at left shows the repair I had make when one of the ferrules melted right out of the plastic. Not pretty. You can see the bobbin with the cover removed (it is glued on with a hard, brittle glue). Eventually I got all the wires resoldered and checked the resistance and inductance to make sure we had a good connection, and then I fitted the new pickups into the instrument. Fortunately, I had already traced out the circuit, but if you are stuck there are some good help sheets on the Entwistle site: http://www.entwistlepickups.com/assets/PBX%20pu%20cct%20standard%20wiring.pdf (though no instructions are included with the pickups). I took the opportunity to replace the potentiometers with brand new parts, as these had become crackly. Now, before I took out the old pickups, I measured the output. In order to get a repeatable result I plucked the string at the 13th fret, holding it down to the fret-board with the tip of the plectum and letting it go. This always gave the same amount of displacement to the string, so it should ring with the same amplitude each time. I used the peak-hold function on the meter and took an average of ten "twangs". I was getting an output of about 80mV. Imagine my disappointment after fitting the new pickups to measure only 5mV. I hooked the guitar up to an amplifier. There was some sound there, but it was weak, and I had to turn the volume up so that it was horribly noisy. Not to put too fine a point on it, as supplied, these pickups are crap. Why? There seemed to be plenty of magnetism, put them two close together on the bench and they snap together strongly. 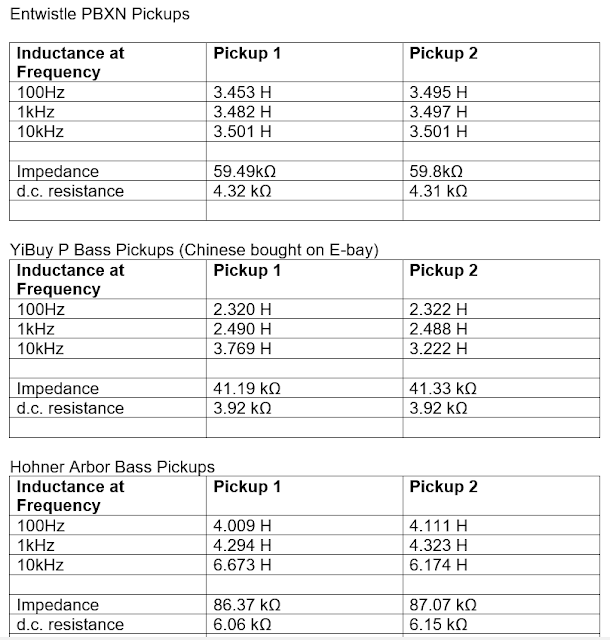 The resistance and inductance measurements were good, indicating that there were lots of turns of wire and that the coils were electrically connected. It was a bit of a mystery. 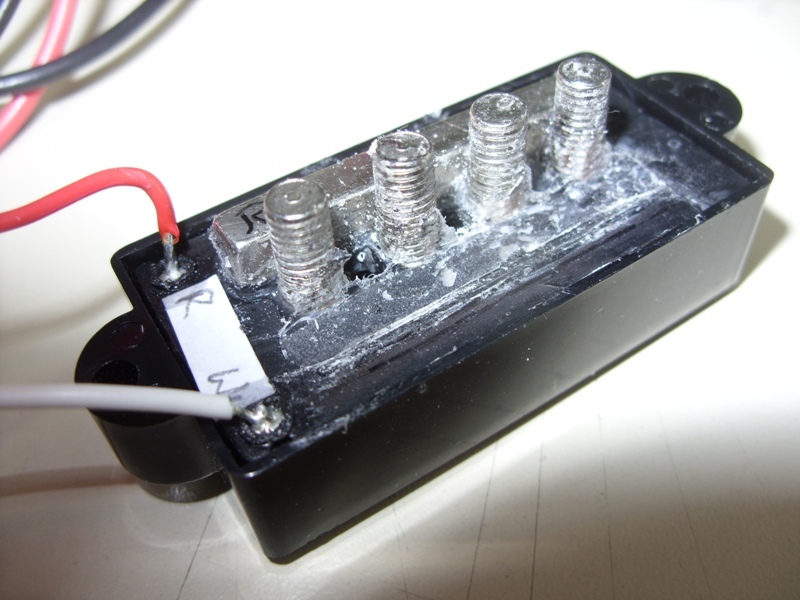 After a bit of investigation with my hall effect magnetic probe, I worked out that the pickups had been assembled wrong. 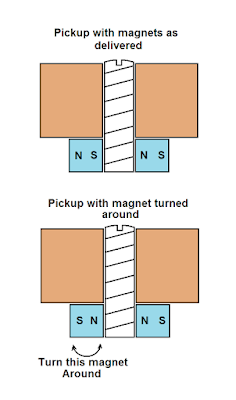 There are two bar-magnets under each pickup, and these should have the same pole facing each other. This "forces" the magnetic field up the pole-pieces to where the strings are. The pickups I had had the magnets arranged North-south, so the field simply went across the bottom of the pickup. The problem was very clear if you touched the pole pieces with a small screwdriver, the field was so weak that the tip of the screwdriver would not stick to the pole-piece. But what to do... was there any chance of getting one of the magnets off and rotating it? Having already made a bit of a mess with the soldering on one of the pickups, I didn't fancy my chances of returning them, so I decided to have a go. The glue that is used is very hard and it is not easy to pry the magnets off. I used a sharp screwdriver and a blunt knife, and worked a little groove in the plastic underneath the magnet, so some leverage could be applied. It is quite risky applying a lot of force with sharp tools, and I was lucky to get away with nothing more than a grazed knuckle. You have been warned! Having removed the magnet, I then became aware of another design flaw in these pickups. The pole pieces are threaded and have a screwdriver slot, so you can adjust them - right? Wrong! - there is so much hard glue around the thread of the pole-pieces there is no way they are ever going to move. Don't even try - you will just chew up the screwdriver slot and spoil the appearance of the pickup. 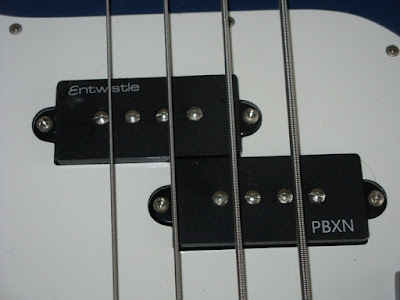 Fortunately the pickups are mounted on springs so you can adjust the height of the pickup under the strings by using the mounting screws to raise or lower one end of the pickup. The photo above shows the springs. It also shows the blocks of foam which were under the original pickups. The Entwistle pickups have the magnets occupying some of this space, but I thought it was a good idea to put some foam underneath - apart from anything, it stops the wires from rattling. So with the magnets prized off and refitted with some hot-glue ... was it worth the effort? Well, yes, we have lots of output - over 100mV. The field cancellation is good too, measured in the Helmholtz coils. But best of all, playing the guitar in the church with the hearing loop - not a trace of feedback or sound from the microphones in the bass amp - so that's a result.